Distribution: The native range of redbreast sunfish includes the Atlantic slope drainages from New Brunswick south to central Florida. 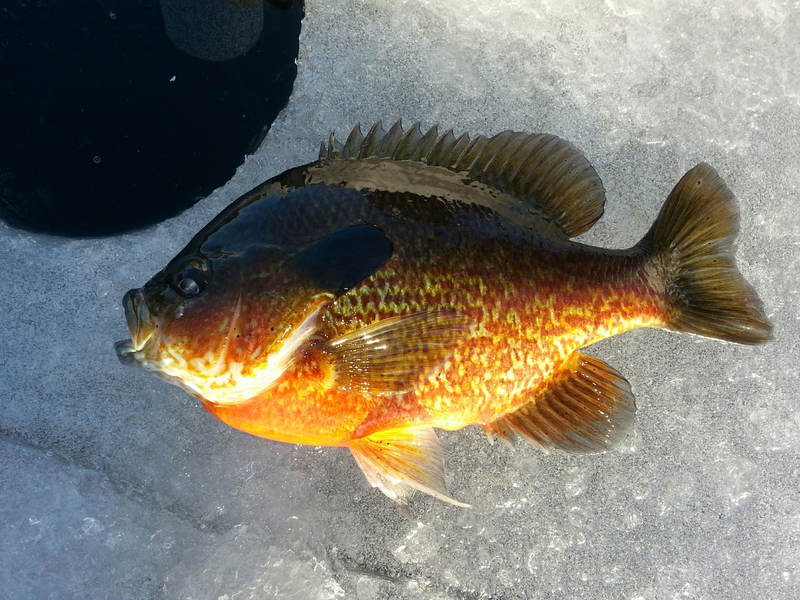 Redbreast sunfish can be found throughout New Hampshire, although they are more common in southern watersheds. 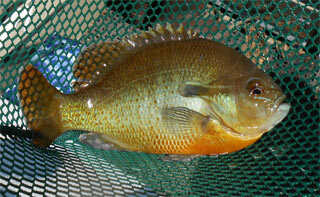 The pectoral fin of the redbreast sunfish is more rounded than that of the pumpkinseed or bluegill. 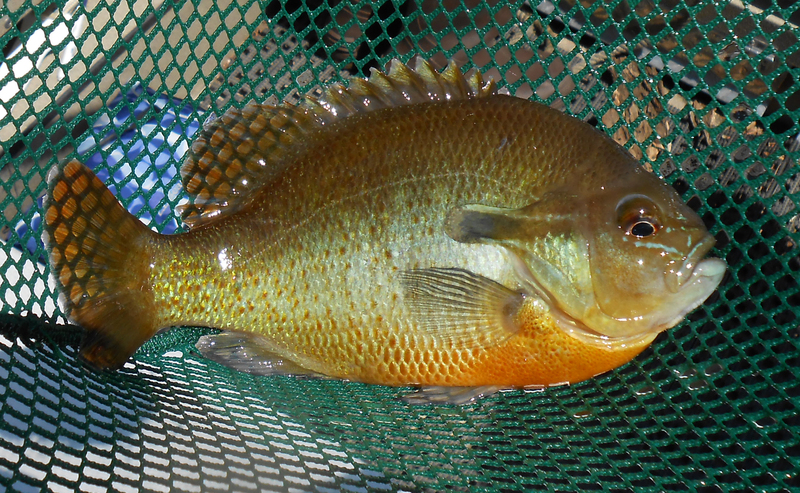 This redbreast sunfish was captured in the lower Merrimack River. Description: The redbreast sunfish may be distinguished from other sunfish species by its narrow, black opercular flap and its small rounded pectoral fins. The pectoral fins of the pumpkinseed and bluegill are pointed. The caudal fin is concave in shape compared to the rounded tail of the banded sunfish. Iridescent blue/green markings occur between the mouth and the eye, but usually do not extend to the gills. The back of the redbreast sunfish is dark green to blue, fading to a reddish orange underbelly. Habitat: Unlike the other sunfish species found in New Hampshire, redbreast sunfish are less dependent on aquatic vegetation as habitat. They prefer slow to moderate flowing sections of medium to larger sized rivers, where they take advantage of fallen trees, overhanging shrubs, or large boulders for cover. They may also be found along the shorelines of lakes and ponds. Life History: Spawning takes place in shallow water in a nest excavated by the male, which clears a shallow depression with movements of its caudal fin. After the male has enticed the female into spawning over the nest, the male will defend the nest until the eggs are hatched. Nests in riverine habitat are made in areas that are sheltered from the current. Redbreast sunfish rarely exceed 10 inches in length. As visual predators with a diet of invertebrates, redbreast sunfish may be vulnerable to extended periods of high turbidity. 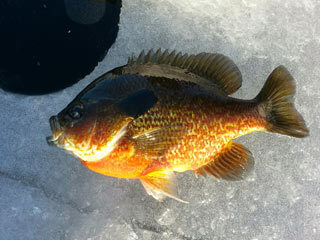 Conservation/Management: Redbreast sunfish are abundant in suitable habitat throughout southern New Hampshire. There are no specific conservation or management objectives for redbreast sunfish. Recommendations: Protecting riparian buffers along rivers and streams, and adequately sizing road/stream crossings will help reduce excess erosion, which leads to extended periods of turbidity and excess sediment deposition. While some erosion and turbidity is natural in a river system during high flows, excess sediment transport for long periods causes stress to redbreast sunfish and other aquatic organisms and may be a sign of an impacted watershed.